Large size wipes so very useful. 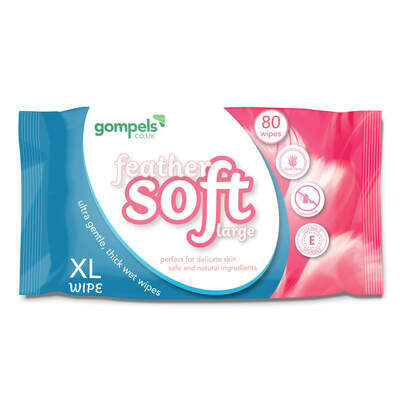 Developed for a wide range of tasks, our Gompels Feather Soft Wet Wipes have been specially formulated to be kind to the skin. Feather soft in their design, each one has been enriched with Aloe Vera and Vitamin E to leave skin feeling both clean and nourished. Dermatologically tested and alcohol free, use this economic pack of 80 wipes for everything from nappy changes through to handling food or cleaning off makeup after a busy day. The hard wearing pack features a resealable label on the top while the fold chosen allows a single wet wipes to be removed at each time. Here at Gompels, we also stock our Proform Large Soft Wipes and our Gompels Moist Cleansing Wipes.